“Such pure and vigorous spiritual power!” Nie Tian’s expression flickered drastically as he sensed wisps of spiritual power of various attributes madly converging on him from all directions. He was completely certain that the black earth he was standing on was releasing the various types of spiritual power it had absorbed over the past centuries from the Qi warriors that had set foot in this place. It was unknown how many powerful experts had come to explore this place and had their spiritual power drained from them. Most of them had eventually died here. After all, the spatial blades had been scattered to every corner of this heaven and earth when the Voidspirit Pagoda hadn’t faced any threats. Even Zhao Shanling had said himself that he had had several life-threatening encounters with the spatial blades, and had been forced to leave the last time he had entered this special realm. Most hadn’t been as lucky as him and hadn’t had the chance to leave. Many of them were Worldly realm and Profound realm experts. Some were even Soul realm experts. They practiced different sorts of incantations, and the copious amounts of spiritual power within their spiritual seas filled this piece of black land. Now that Zhao Shanling had solved the puzzles and entered the Voidspirit Pagoda, the restrictive spell that had enveloped this heaven and earth for centuries was finally lifted. As a result, various types of raging spiritual power burst forth from the depths of the earth. After figuring out what was happening, Nie Tian focused on channeling the vigorous spiritual power into himself. Moments later, an idea struck him: he could form spiritual energy balls with the rich spiritual energy in the air. “This is a brilliant idea!” he thought to himself. Within seconds, a huge spiritual energy ball came to form on his palm. After a filtering process was applied, the spiritual energy ball was filled with nothing but refined spiritual power, flame power, and wood power. Then, he started channeling the extremely refined energy within the spiritual energy ball into his spiritual sea. Soon, all of his vortexes of spiritual power, wood power, and flame power brimmed with fully refined power. However, endless spiritual power of various attributes was still rising from the earth, filling the air. Without much thought, Nie Tian started expanding his vortexes of spiritual power with the copious amount of spiritual power in this place. What he didn’t know was that the moment Zhao Shanling had entered the Voidspirit Pagoda, another change had been triggered: no one else was allowed in, only those which were already here could remain. Even if more powerful experts from the Bliss Mountain Sect and the Trisword Sect had been sent to this special realm, they would have been stopped at the entrance in the space disruption zone. All of these changes had been triggered by Zhao Shanling’s entrance into the Voidspirit Pagoda. Time flew as Nie Tian cultivated. After an unknown period of time, he slowly opened his eyes. He jerked his head towards the Voidspirit Pagoda. Everything seemed normal with the Voidspirit Pagoda. Numerous spatial blades were still hovering around it. Zhao Shanling was nowhere to be seen, and he couldn’t sense Zhao Shanling’s aura either. He took out the turtle shell compass and looked at it. The wisp of soul essence was still there, which meant that Zhao Shanling was still alive. With a sigh of relief, he started analyzing the vigorous spiritual power that filled the air, his eyes narrowed. He discovered that there were more than a dozen types of spiritual power in the air. However, star power wasn’t one of them. “Star power is a rare type of spiritual power, after all. It looks like I’ll have to recover my star power with Star Stones, inefficient as it is.” With this thought in mind, he took out some Star Stones from within his ring of holding and started cultivating. At this moment, his vortex of spiritual power was the only vortex in his spiritual sea that hadn’t been refined and expanded to its limit. All of his other vortexes had been refined and expanded to the point where they were ready for his breakthrough into the Worldly realm. Once his vortex of star power was fully refined and expanded, he would reach the threshold of entering the Worldly realm. Given an opportunity, he would be able to make the breakthrough. “The Worldly realm...” Nie Tian slowly closed his eyes and started channeling star power from the Star Stones. The Nine Stars Flower had taken root at the bottom of his vortex of star power, in the middle of his lake of stardew. As soon as a drop of stardew formed, it would be absorbed by the Nine Stars Flower. While the Nine Stars Flower absorbed stardew, it also extracted liquidized wood power from the bottom of his vortex of wood power at a high rate. Since there was a copious amount of wood power in the air, he wasn’t worried that he would run out of liquidized wood power. However, it was very frustrating to see the stardew, which he went to great lengths to condense, absorbed by the Nine Stars Flower the moment it formed. The only perk the Nine Stars Flower had brought him was that it had improved his efficiency of channeling power from Star Stones. It was just that he couldn’t benefit from it for the time being. That was because no matter how much stardew he condensed, it would be absorbed by the Nine Stars Flower, preventing him from gathering enough stardew to refine and expand his vortex of star power. If he couldn’t do this, even though all of his other vortexes had reached the breakthrough point, he still wouldn’t be able to enter the Worldly realm. Gritting his teeth, Nie Tian took out more Star Stones. He madly channeled power from them and formed stardew for the Nine Stars Flower to absorb. As time passed, nearly a thousand drained Star Stones piled into a small hill beside him. Even so, the Nine Stars Flower still hadn’t shown any sign of being satisfied. During this time, Nie Tian also had to replenish his wood power and condense more liquidized wood power to facilitated the Nine Stars Flower’s absorption of star power. One day, while Nie Tian was channeling star power from Star Stones with a distorted face, Zhao Shanling suddenly walked out of the Voidspirit Pagoda. Zhao Shanling looked much skinnier than when he had entered. His eyes had sunk deep into their sockets, as if they were depleted of soul power as well. However, his eyes were shining with the light of excitement, and a complacent smile could be seen on his face, as if he had obtained what he had yearned for. As soon as he stepped out of the Voidspirit Pagoda, the towering pagoda rapidly shrank down. In a couple of seconds, it shrunk to the size of a corn kernel and flew into his splayed hand. “Senior Zhao!” Nie Tian exclaimed joyously. Since Zhao Shanling had a time-keeping instrument, he didn’t question Zhao Shanling’s words in the slightest. Zhao Shanling was taken aback. After pondering for some time, he said, “I’ve never heard anything about Nine Stars Flowers. But since it has such a large demand for star power, and it has taken root in your spiritual sea, I’m sure that it will show its magical use some day. The Voidspirit Pagoda suddenly flew out of his palm and came to a stop over his head. Spatial power then started converging on him from all directions like surging sea waves in a storm. Hey guys, I read about Bagua (the Eight Diagrams) the other day, so I put together the following content for you. I hope you'll find them fun to read. 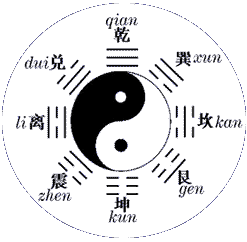 The Chinese picture of Taichi and the Eight Diagrams is still being studied by some Western scholars as a source of ancient science. It is certainly an important heritage of Chinese science and culture, though at times it was used for superstitious activities.